George Eliot wrote of Romola in 1877 that she 'could swear by every sentence as having been written with my best blood.' Romola was the only historical novel she ever wrote, and the editor of the Clarendon edition, Andrew Brown, describes it as 'the least accessible of her works of fiction' as far as the general reader is concerned. It is what he calls 'a formidably learned book', and his superb introduction traces the formidable amount of research George Eliot undertook for it. He indicates the anguish involved in its writing, its initial critical reception and the number of editions published in the author's lifetime together with a host of other relevant and fascinating information. This edition is dedicated, exemplary: it was many years in the making, and I trust that the editor will not misconstrue my emphasis when I say that it is the key to all Romola. A fortnight's holiday in Florence in 1860 apparently signalled the first movement towards her subject. George Eliot's early comments, as one might expect from one so diffident, are guarded, so much so that she does not consider publishing it (if it is written) before she has completed 'another English story'. There is no question at this stage of her leaving her publisher John Blackwood, for she feels that it should appear in Maga. 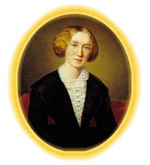 By 10 March 1861 she has delivered the final pages of the English story (Silas Mamer) to him, and Lewes recorded in his Journal that they were 'talking of the Italian Romance that Polly is contemplating'. On 19 April they set out for Florence: Andrew Brown: reconstructs 'the course of their research there through the survival of their borrowing slips in the Magliabecchian Library. They researched the city too, spending there, according to the entry in George Eliot's Journal 'thirty-four days of precious time'. After they arrived home she studied the background, suffering as so often from periodic headaches and depression.